Doctors don't know exactly what causes eczema. 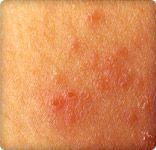 The most common type of eczema -- atopic dermatitis -- resembles an allergy. But the skin irritation, which is more often seen in children rather than adults, is not an allergic reaction. Eczema is not contagious. You or your children can't catch eczema by coming in contact with someone who has it. Doctors also know that a large percentage of children with severe eczema will later develop asthma or other allergies. Mother's age at time of birth. It's not clear why, but children born to older women are more likely to develop eczema than children born to younger women. Eczema is not an allergic reaction. Even so, a large number of children who have eczema also have food allergies. That doesn't mean that certain foods such as dairy, eggs, and nuts -- common food allergy triggers in children with eczema -- cause it or make it worse. Before removing particular foods from your child's diet, talk with your health care provider to be sure your child's nutritional needs will be met. A trigger is not something that causes eczema. But it can cause it to flare or make a flare worse. The most common triggers are substances that irritate the skin. For instance, in many people with eczema, wool or man-made fibers that come in contact with the skin can trigger a flare. Stress has also been identified as a possible trigger. National Institute of Arthritis and Musculoskeletal and Skin Diseases: "What Is Atopic Dermatitis?"